Kenya has opened its doors for tourists and other travelers from the East African region and the rest of Africa with ease and visa free access to the Kenyan cities and other areas of tourist visiting and business. Mr. Uhuru Kenyatta, the President of Kenya, has opened his country’s doors to Africans visiting Kenya and said all were welcomed to travel to his country without landing visa upon the arrival. 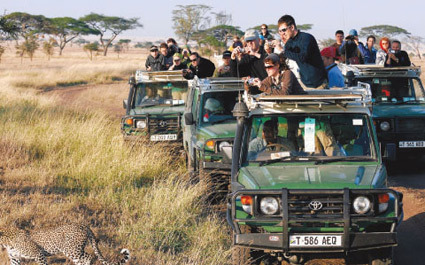 The leading Tourism destination in East Africa Kenya, is now standing among nations pushing for the much awaited Intra-Africa travel and tourism development, attracting African travelers to visit its high profile tourist attractions, mostly the wildlife. President Kenyatta said no longer visa requirement before travelling to Kenya as his personal initiative to spearhead the continent-wide push to boost integration and free movement. During his inauguration for a second term in office, President Uhuru Kenyatta said that Africans wishing to visit Kenya will be eligible to receive a visa on arrival. The directive, he said, was meant to enhance trade, security, and intercontinental travel. Kenya already had one of the more straightforward online processes for short-term visas. The Country has now joined 21 African countries which had relaxed or scrapped visa rules. Rwanda, Seychelles, Mauritius, Nigeria, Ghana and Benin had no visa requirements for long since the past two years. The African Union also launched a continental passport last year as part of its move to encourage open borders. The Kenyan President said that members of the East African Community (EAC) will be treated as Kenyans when they visit his country. They will be able to use their identity cards, and no need for passports to do business and own property in Kenya.